One of the greatest Queensland attractions is the lifestyle. It's sunny, colourful, positive and relaxed. Living for the moment comes naturally here. To discover the best things to do in Queensland, simply live like a local. Enjoy the freshest seafood prepared by world-class chefs, lose yourself in a lively art scene or chill out beachside with a cup of delicious locally-grown coffee. Your Queensland holiday will be packed with pleasure and daily surprises. Immerse yourself in the energetic lifestyle of Queensland, where life is lived outdoors. Enjoy shopping, farmers' markets, alfresco dining and beach culture in a warm, sunny climate. In Brisbane you'll have no problem finding bars and restaurants that come with a great view. 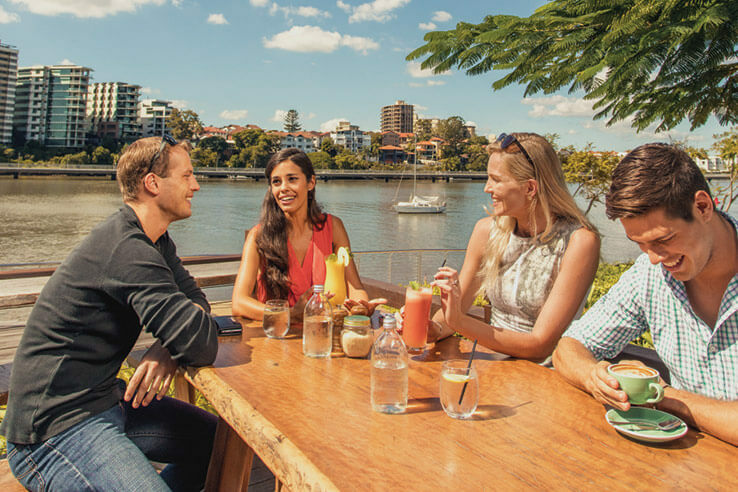 You can sip a refreshing cocktail somewhere riverside like Eagle Street Pier, relax in the cool breeze at a rooftop venue or dine at the top of Mt Coot-tha with views across the CBD towards Moreton Bay. To get acquainted with some of Brisbane's furrier residents, catch a ferry from the CBD to Lone Pine Koala Sanctuary, Queensland. It's a great way to see the city and leafy suburbs from the river, and the sanctuary has been voted one of the best zoos in the world. Here you can meet, hold and feed all kinds of Australian wildlife. You'll leave primed and ready for other natural encounters in Queensland. At the Lone Pine Koala Sanctuary, you can meet, hold and feed all kinds of Australian wildlife. Koalas included! If you prefer something more theatrical, make your way to a show at one of the city's many performing arts venues. The Brisbane Powerhouse, previously a 1920s power station, has been brought back to life as a contemporary arts centre that's home to a colourful array of theatre productions and festivals. If fine art is your thing, check out the local and international exhibitions at Queensland Art Gallery and GOMA. Located a short stroll from each other in South Bank, they're the largest of Brisbane's many galleries. When it comes to exploring the best restaurants, Queensland is a foodie's paradise, with fresh local ingredients and talented chefs creating exceptional experiences at eateries and cooking schools throughout the state. If you're looking for fun things to do on the Gold Coast, you can feed the soul, the closet and the appetite at any one of the popular markets and food collectives. There are almost too many to choose from, so just ask the locals what's on and when. For example, in the suburb of Miami on Wednesday nights you can nibble your way around the world when Miami Marketta Street Food hosts the Tapas Club. Or you can browse local designers while you sip on a fresh smoothie at the humming village markets in Burleigh Heads on the first and third Sunday of every month. To immerse yourself in a day of retail therapy, head to the newly refurbished Pacific Fair in Broadbeach - it's open seven days a week. With more than 400 stores, including exclusive European brands and well-known high street shops, you'll be in fashion heaven. After a bargain? Try the Harbour Town Gold Coast outlet shopping centre in Biggera Waters for amazing discounts on well-known brands. You'll also discover plenty of things to do on the Gold Coast at night. Live music, ten-pin bowling, karaoke bars, boutique breweries, rooftop bars and all kinds of night clubs are among the after-dark things to do in Surfers Paradise. Pack a healthy appetite and a sense of adventure when heading to the Sunshine Coast. If you're looking to extend your kitchen capabilities, the region offers spectacular cooking schools. You can master the secrets of Thai cooking in a dense tropical garden at Spirit House, or learn to cook like a local using the freshest Sunshine Coast produce at The Cooking School Noosa. There's a continuous programme of events in Queensland and the Noosa International Food and Wine Festival in May is a highlight on the Sunshine Coast foodie calendar. Handmade crafts and delicious artisan foods draw an appreciative crowd at the Eumundi outdoor markets every Saturday and Wednesday. With more than 600 stalls, live entertainment and a friendly relaxed atmosphere, it's easy to spend the morning collecting treasures and tasting treats beneath the leafy canopy. With no entry fee, Eumundi is highly rated among the free things to do in Queensland. Port Douglas is a gateway to the reefs, islands and beaches north of Cairns and it has a tropical food scene worthy of the journey. Stroll down Macrossan Street for a spot of shopping, then relax and unwind with a refreshing cocktail at one of the many restaurants and bars as the sun sets beyond the palm trees. Filled with natural attractions, Queensland is a great destination for adventure and discovery. For a tropical tasting tour through exceptional landscapes, head inland to the Atherton Tablelands, which are part of the Great Dividing Range. A relaxing 45-minute drive from Cairns, this fertile landscape includes rolling hills, green fields, rugged bush, waterfalls and lakes. It's home to a wide range of gourmet food sources, such as macadamia nut farms, tropical fruit orchards, dairy farms, wineries and Australia's oldest coffee plantation.